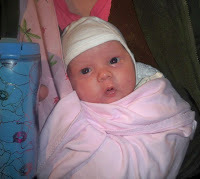 We were out of the house and loading up in the van by 8:45 Thursday morning to go to appointments for eye exams. It was just Mr. S and Mr. M that had appointments, Miss E and Mr. R had had theirs a couple of weeks ago. The boys did great at their appointments. I was glad those went well since we still had a full day of errands ahead of us! We then headed off to Costco to pick up a few things we needed before Christmas. Then we headed over to the PX (post exchange) to pick out new glasses, which took a while. Then we were off to the commissary to do our last bit of Christmas grocery shopping. 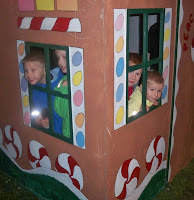 The kids were all quite good and were told so several times by people while we were out. The kids were all beaming since each favorable comment earns them a candy from our candy bucket (with a limit of five), they hit their limit and then some today! They were so happy to go home and have lunch and get their candies! As if that was not enough to do, we still had more errands! The kids unloaded all of the groceries and started making their sandwiches while I fed Miss C. After the groceries were put away and our lunch mess was cleaned up we picked Rob up at work. The butcher had called a couple of days ago to let us know his sausages from his pig hunt were ready for him to pick up. We figured it would be fun for the kids to see the place, so we all headed up there. On our way we stopped at the army surplus store (everyone had a great time looking around, even Miss J!). 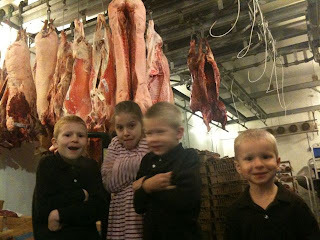 Once we got to the butcher's shop I stayed in the car with the two little girls while Rob took the big kids in. They got a tour of the back of the shop (field trip!)! little park they had decorated. 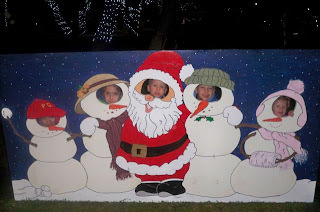 The kids had a wonderful time running around and getting their pictures taken with the props that were set up. It was a long day, and we were all worn out once we got home, but it sure was fun!